Errol: I try to get to all the comments, but then sometimes you guys comment to the characters, and I feel weird commenting or answering for them. ^_^ Funny thing. Oh, I also put up Vix’s bio up there, in case you wanted to know. And I made small site changes. If there is any other improvements for the site you can think of, I can try and accommodate! Victoria: What’s up with Jen’s eyes in the second panel? Who can say! The WordPress interface sure has changed since the last time I used it. It took me longer than I’d like to admit to figure out how to colour this text. But now I’m PURPLE. LIKE A WOMBAT. This entry was posted in 2013, Uncategorized and tagged jen, rob. Bookmark the permalink. Embrace the multiple personalities. I have long ago. Complete conversations on long car rides or in the shower. I kid. Kind of. Come on, Rob! You need to write for me this year! We believe in your awesomeness! Wombats are purple? Eh, in didn’t know that. “MANIC Loves Company!” Oh yeah. The insanity, the wombats… it’s all love, right? Wombats! Yay! Purple! Yay! 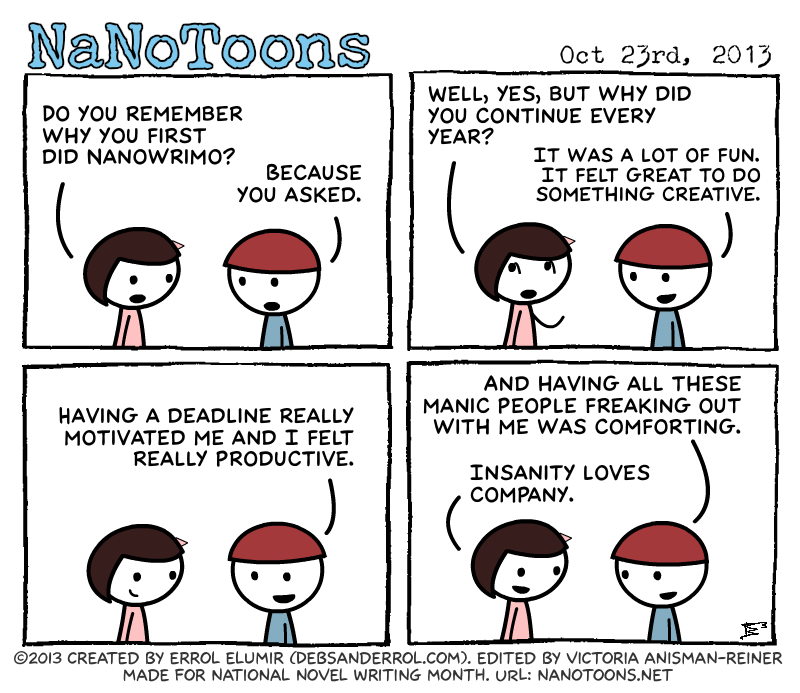 NaNo! Yay! No do NaNo? Boo. Yay! No editor! ‘Tis the season! Deck your freezers with frozen dinners, fa la la la la Na No Wri Mo, tis the season to do word wars fa la la la la Na No Wri Mo, when we don’t use our inner editors, fa la la la la la Na-a-No, toll the classic Nano Musical, fa la la la la Na No Wri Mo……Fa La La La La La Na No Wri Mo!!!!!!! !